Steve Bannon, former executive chair for the alt-right Breitbart News and CEO of the Trump presidential campaign, is now White House Chief Strategist and sits on the National Security Council (NSC). How did this man come to such prominence? Bannon is a graduate of Harvard Business School, Navy veteran, former Goldman Sachs banker, and Hollywood producer. He rose to fame in the wake of the Tea Party revolution which originated as a right-wing protest to the Wall Street bank bailouts during the ’08 financial crisis. 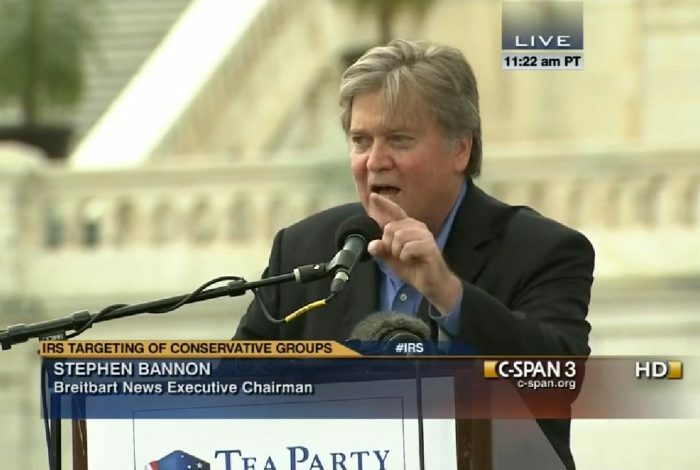 The bottom video below of Bannon speaking at a 2010 Tea Party rally in New York City is instructive. Though he neglects to mention the effect of the Bush tax cuts or Middle-Eastern wars on the debt and deficit, his alarm bells for the exploding national debt likely resonate with Americans who themselves know the sting and humiliation of personal indebtedness. Bannon, like President Donald Trump, is a paradox. He is a wealthy Ivy League-educated investment banker with connections to Wall Street and Hollywood that the populist right so despises, yet he has effectively used strong rhetoric against such targets to mobilize a significant number of the US population to back a billionaire Manhattan real-estate tycoon turned reality TV star running on a populist “America first” platform. Don’t change the channel folks. Related front page panorama photo credit: Adapted by WhoWhatWhy from Trump and staff (CSPAN).